In the West, many of us know yoga as a straightforward strength and flexibility improving workout. But the truth is that yoga is so much more than an exercise routine – it has many benefits, and many of them extend beyond physical fitness! In fact, yoga was originally developed as part of a contemplative practice. 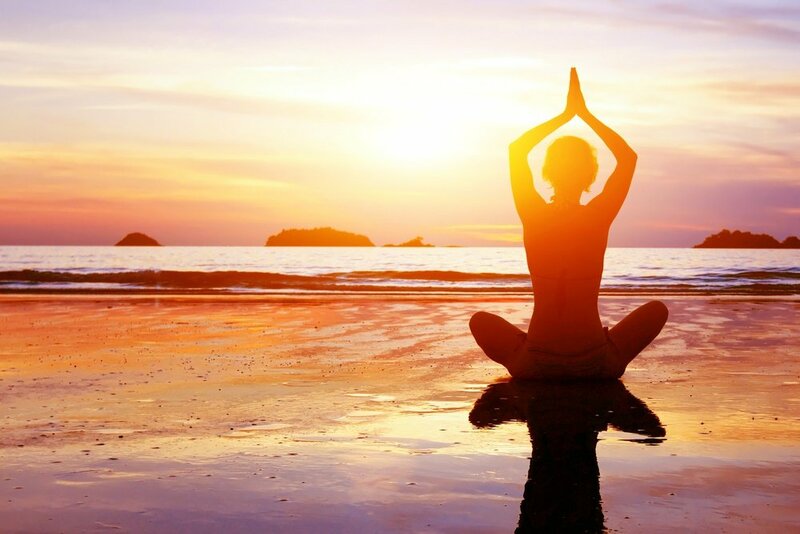 Yoga’s origins are deeply connected to an ancient Indian religious text known as the Vedas and also intertwined with the twin practice of meditation. The founders of yoga always intended for meditation to be a critical part, if not the most important, part of the practice. There are many reasons why you may want to bring meditation into your own yoga practice. First, let’s start with the benefits of meditation itself. Studies on meditation have shown that it dramatically reduces stress and even has a long-term impact on mood regulation over time. Additionally, meditation reduces the habit of worrying since it trains your mind to focus on the present moment. Worry can only exist when one is dwelling on the past or the future. By focusing on the breath and letting go of any thoughts that may pop up, meditation enables you to quietly observe your mind and thought patterns. It makes you more aware of your feelings and can help you to feel more grounded in your body. Meditation contributes to feeling rested and sense of wellbeing. By some accounts meditation can be just as restorative for the body as sleeping. It induces relaxation and also improves concentration. You probably noticed that many of the benefits of meditation overlap with the benefits of yoga. Essentially this means that you’re getting more bang for your buck when you combine the two. This means you’re multiplying the reward tenfold without having to put in any additional time. Let’s look at the ways that meditation actually enhances your yoga practice. Better awareness of self means increased ability to go deeper into poses with correct form. Your physical yoga practice will vastly improve by incorporating meditation. Breathing deeply and marrying the breath to the movement will help you to be aware of your body and its needs. You will be better equipped to go deeper into poses and to be mindful of correct form. In turn, this reduces the risk of injury. Observation of the mind increases staying power. Most of us know what it feels like to be in a yoga pose we find slightly uncomfortable and to have our mind be screaming about it. That voice in your head is the reason why many people will come out of a yoga pose sooner than they need to. Meditation helps you to identify that part of the mind, acknowledge the negative thoughts, and let them go. You’ll be more likely to breathe into the stretch than to fall out of the pose if you incorporate meditation into your practice. Meditation increases acceptance, which means less frustration. Many of us aspire to complex poses that require more strength and flexibility than we currently possess. Meditation and meditative breathing during yoga increase your ability to be compassionate and to meet yourself where you are today. By combatting frustration, meditation during yoga ensures that you will keep up a regular practice. Meditation and yoga are both exceptional self-care practices that will boost your overall well- being. As discussed, yoga benefits from meditation. Meditation can also benefit from yoga. According to some historians, the physical practice of yoga was developed specifically to allow for long periods of sitting in meditation, with minimal discomfort. Furthermore, some people who may find it difficult to sit still for meditation, can count on their yoga practice for a daily mindfulness ritual. Here’s how to incorporate meditation into your yoga practice. Yoga was built for meditation. Remember this! You don’t need to make it complicated – yoga was made for meditation. Focus on your breathing as you go through your postures, tying an inhale or exhale to each movement. Devote your time on the mat to yourself and to your practice, letting thoughts about your to-do list, or anything that pops up, go. Take a few minutes to find your breath at the beginning of your practice. Use the first few minutes in the yoga classroom, before hitting play on your instructional video or before your home practice, to get settled on the mat and take three deep breaths. Try to extend your inhale and your exhale as much as possible, keeping them even. Most yoga instructors still keep the old practice of Savasana at the end of their routines. This is the time at the end of the class where you take a few moments to stay still and to let the benefits of your practice roll over you. Don’t start rolling up your mat at the end of your class without taking a few moments to sit in Savasana. If you lost track of your breath during your practice, use this time to tune into your breathing again. If you felt like you maintained good focus throughout, you can still take this time to deepen your breathing and tune into your body before going on your way. David Foley is a young Irish psychologist, a therapist, and a personal growth enthusiast at Unifycosmos.com/holosync. He lives in rural Ireland where he plays tennis, canoes, meditates, writes and visits friends for cups of tea regularly. David was a software engineer in a past life, whereupon a love of the human mind and of Asian mysticism and esoterica was developed. He undertook studies in an MA in Psychology and began talking to those who wanted to share their lives. He meditates daily and likes to take life at a pace conducive to reflection and contemplation. It’s enormous that you are getting ideas from this article as well as from our discussion made here.